Take a walk around a park, nature preserve, or your neighborhood and you are apt to see a plant that was introduced with good intentions that has now become wildly invasive and unbelievably difficult to control. Lesser celandine (Ranunculus ficaria) was introduced to the United States in 1800’s as an ornamental plant. However, due to no known pests or diseases, coupled with its ability to flourish in just about any growing condition, the plant thrived and has since been listed as an invasive plant. Lesser celandine creates a short, thick mat that becomes impenetrable by other plants. Native spring ephemeral are quickly choked out. Left unchecked it can easily destroy a native ecosystem in a few years. 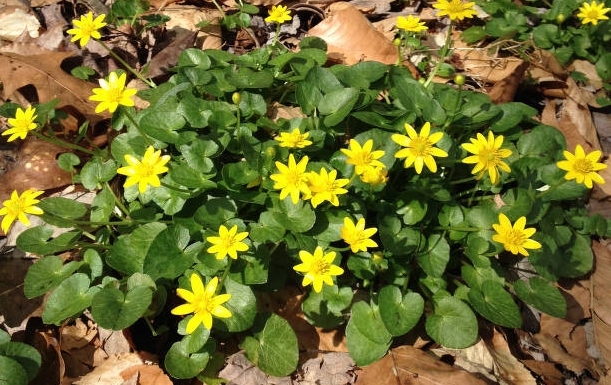 A homeowner may have a small clump of lesser celandine in the garden and be attracted to it. It appears tidy, has glossy green leaves, and emerges very early in the spring and delights us with cheery yellow flowers. One can’t find a reason to be alarmed or inspired to remove the plant. However, in a short period of time, the tidy clump has transformed into a thick carpet, escaping all boundaries and invading every corner of the garden and lawn. Hand digging is futile in most cases. If even a tiny part of the tuberous root is left behind the plant will rebound with ease. Deep digging is one method. All the soil is removed from the bed, sifted and replaced. Follow-up care is required to ensure remnant pieces that were inadvertently left behind to rejuvenate can be addressed. Another alternative is chemical treatments. Whichever method of eradication is selected, it’s a slow trudge to success.